The new LifeStraw Steel has been named the Gold ISPO Award Winner for 2016/2017 in the Outdoor category, meaning the most exceptional product in the industry from around the world! The Scrubba Wash Bag is the lightest and most compact "washing machine" anywhere--perfect for travelers and campers and adventurers. The Simple Shower is a great little product that will convert most any one- or two-liter bottle (or Platypus collapsible bottles and bladders) into a low-flow shower. Stay clean and refreshed wherever the trail takes you, or keep your best friend smelling like a rose. We've got freeze dried Surplus Uncooked Hamburger Patties back in stock! Available by the can or case. As much as 24% off! Have we got NEW for you! We had the patties in stock last year in early 2014 and we had published a similar chart from Bureau of Labor Statistics. 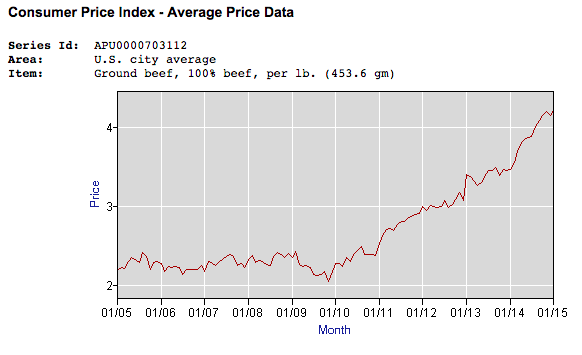 Have a look at the updated chart below, in just 1 year prices have gone really high and this trend will continue. There's really only one way to take immediate productive action to protect your household from inflation, and that is to lock-in today's prices by purchasing foods that store indefinitely. Freeze Dried Uncooked Hamburger Patties.. Note: This is a PreSale promotion. Will ship within a week. We only have 20 cases so hurry !! These Freeze Dried/Uncooked hamburger patties are a whopping 1/2in thick. All cans were sealed in an oxygen/moisture free environment. These Beef Patties are current production over-runs, Manufactured in 2014, from a large military defense contractor. We just purchased a large lot of these direct from a Defense Reutilization Office (DRO) Source. You can also by a can.